On a large white-sand beach, next to RIU Palace Las Americas, The Beach Palace has 3 pools, 6 restaurants, 4 bars, 3 swim up bars, and plentiful beach views. 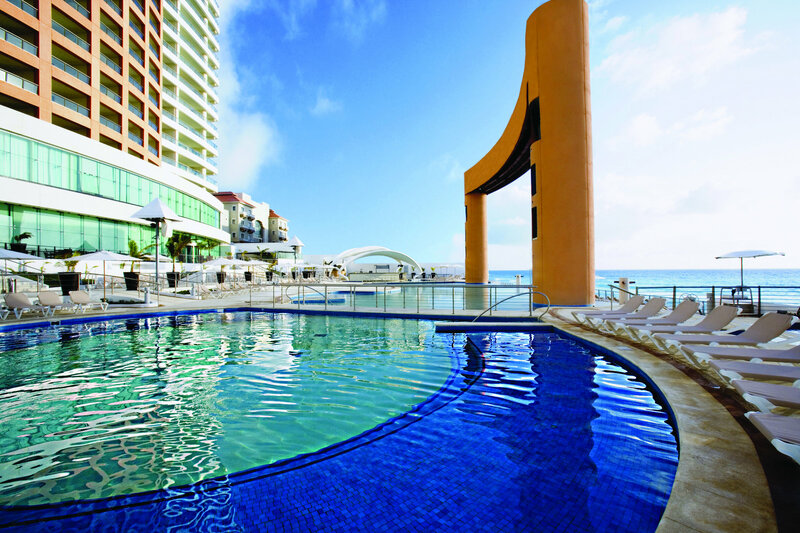 Beach Palace resort all inclusive vacation packages include the best features of any all inclusive Cancun resorts. 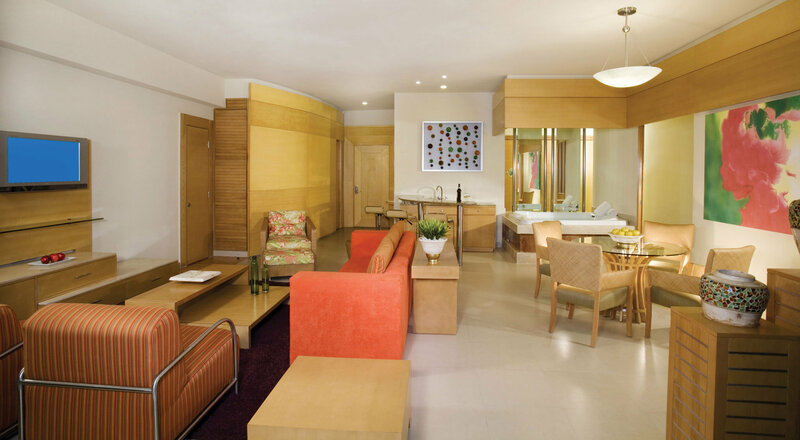 All rooms include jacuzzis, balconies, and great amenities, making it the best hotel in Cancun. Beach Palace group rates are affordable and make it one of the best all inclusive resorts. This hotel is sleek and trendy. 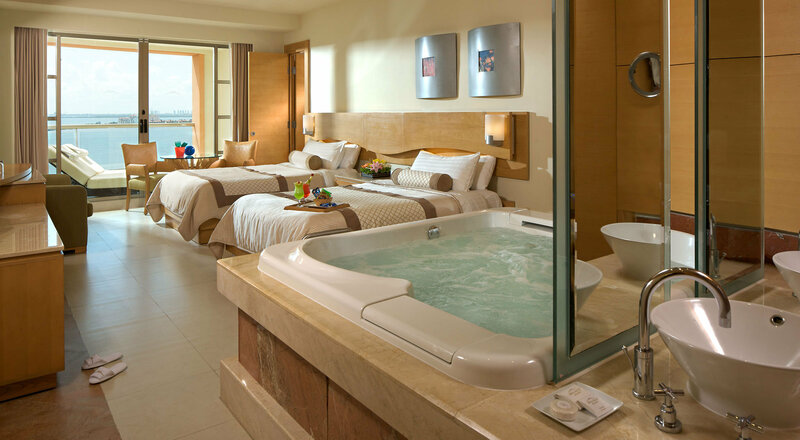 It includes a fitness center, spa, and WiFi, allowing guests to enjoy the best of Cancun all inclusive resorts. Everything you want from a luxury vacation! 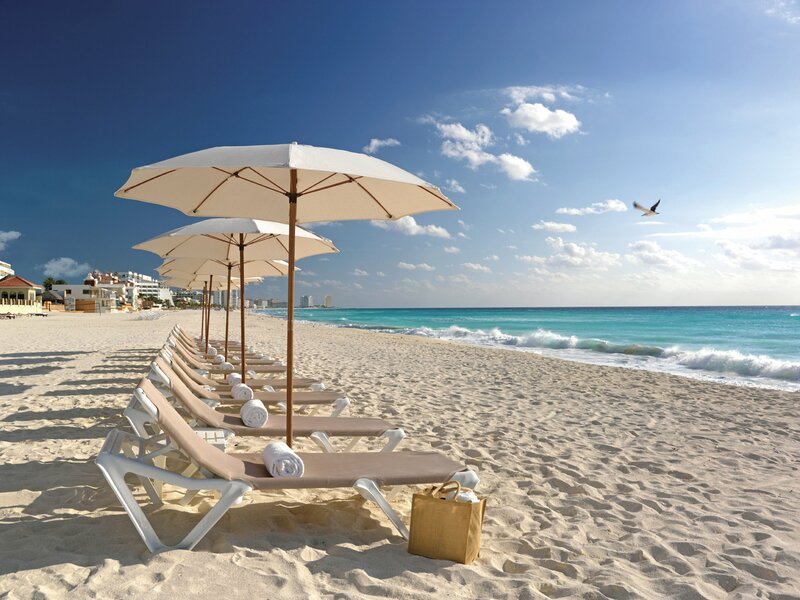 Nestled in the heart of Cancun’s Hotel Zone, The Beach Palace allows guests to engulf themselves in the upbeat nightlife that Cancun has to offer, as well as giving them the ability to spend their day shopping around the area. You’ll get the chance to try some of the local’s favorite bars, restaurants, and nightclubs, ultimately allowing you to have the vacation of a lifetime! Whether you plan to impressive your spouse, kids, or friends, we guarantee you’ll shock whoever is lucky enough to accompany you on your next Cancun vacation. A vacation to Mexico should be safe, enjoyable, and an overall legendary experience. That’s why you need to choose the vacation package that fits your every need. You want endless cocktails? A beach view? Close proximity to the party atmosphere? No specification is too specific and we aim to bring you the most detailed information on the web, thus allowing you to access up to date and pertinent information for your travel planning needs. When we say “All Inclusive”, what do we actually mean? We mean that everything from the point that you arrive, until you decide to return the room key and check out, is 100%, completely paid for. You choose a specific package that meets your detailed requirements and once you’ve successfully paid the package in advance, you won’t need to pay for meals, cocktails, etc. while you vacation in Cancun. The Beach Palace and many other all-inclusive resorts make up a section of the beach in Cancun referred to as the “Hotel Zone”. In addition to being home to several of the most luxurious resorts in the area, this zone is also the stomping ground for the most lively parties in Cancun. You won’t want to choose this area if you’re interested in spending your day sight seeing ruins and partaking in walking tours, because the atmosphere here is 100% turn up. Here, you’ll find shimmering white sand beaches, endless happy hours, and amazing parties. Imagine a long stretch of beach, inhabited by hundreds of tourists, enjoying enjoy their vacation with a few cold beers and a smile from ear to ear. There is a ton about The Beach Palace that keeps vacationers returning year after year. Maybe it’s the 287 rooms available, one of the three incredible pools, high tech amenities, or possibly it’s the location of The Beach Palace? You have just about everything you’d ever need during vacation, all at your fingertips, and already paid for in advance. The service at The Beach Palace is extraordinary and guests often rave about how friendly the resort staff was during their vacation. A lot of the time a vacation can either be made or destroyed by the quality of services, but for this resort, that will be the last thing on your mind. The Beach Palace has been providing exceptional service for years and have a specific groove they’ve been sharing with guests for a number of years. If you are hoping to spend your next Cancun, Mexico vacation in the heart of the party and want to spend your days doing nothing more than drinking and relaxing, then this resort may be one of the best options. Packages at The Beach Palace are flexible in order to satisfy each and every customers needs, so don’t be shy when trying to design the perfect vacation. Bottom line is: the resort delivers the ultimate vacation. Whether you’re a golfer, honeymooner, elderly couple, or large family, The Beach Palace gives you the experience of a lifetime and will guarantee to have you leaving in a different state of mind. 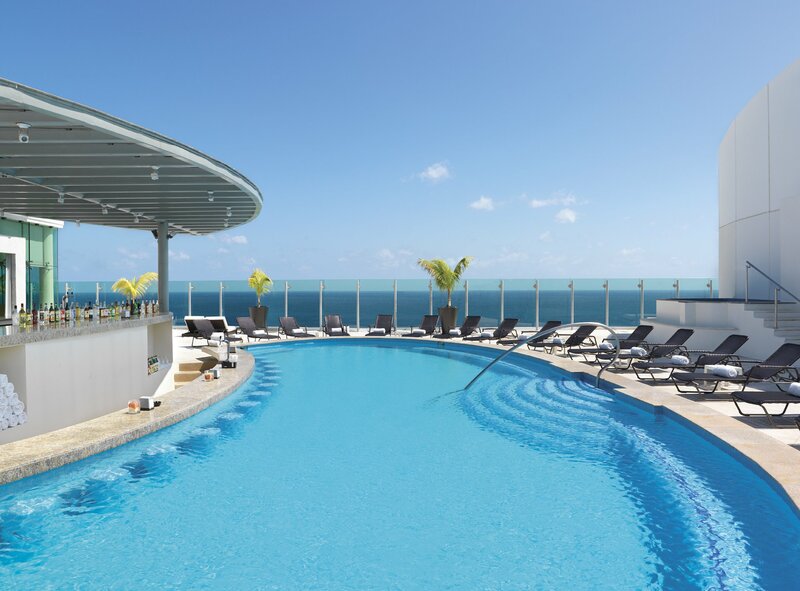 Start planning your next family’s vacation today and see how it feels to truly treat yourself! One awesome factor of booking a vacation with Mexico Group Travel, is we offer packages that are able to accommodate larger groups. This allows you to plan a trip with your closest friends and have the vacation of a lifetime. You can reserve a large table, order rounds of top shelf tequila, and spend the night dancing your troubles away! The Beach Palace is one of the preferred choices for group resorts, because they excel at accommodating parties of all shapes and sizes. The pools are remarkable, for they are able to fit hundreds of people, ensuring you’re not overcrowded while you vacation in Cancun. There are not too many places in the world where you can visit with your entire squad of friends and family, but the Beach Palace makes this possible offering very impressive group packages. Organize a game of pool basketball or frisbee on the beach, but regardless how you choose to spend your group’s vacation, we promise that it will be full of stories that you’ll tell for years to come!